Getting your website to load faster is always a good idea. It can impact your rankings in both Google organic search and the Google AdWords auction, and it’ll make your users happier. No one likes to sit around and wait for a site to render. Sometimes it’s the difference between someone sticking around on your site and them bouncing. 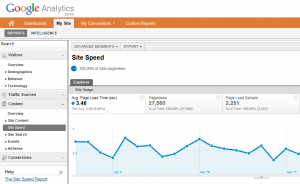 That’s why the latest report announced in the new Google Analytics is all about Site Speed. Now you can find out which pages are loading slowly, how your site’s load times are affecting expensive advertising channels, and the correlation between load times and conversion rates. Best of all, you now have access to the Average Page Load Time metric in the Custom Report builder, so you can pair it up against all sorts of fun segments: browser, campaign, geo-location. To start using this new report, just make a small addition to your existing Google Analytics tracking code. Once you’ve done that, Google Analytics will begin to use a sample of your pages to calculate the load time. If you’re interested, you can actually see the number of pages it uses with the Page Load Sample metric. The count begins as soon as the visitor has clicked to a page and uses the W3C’s NavigationTiming spec. No word yet on whether or not browsers that don’t support NavigationTiming (IE8, Firefox 3) will be tracked with a legacy mechanism.